Ashdale Events with Gerrard-Ashdale Library. NFB Film Club: The Fruit Hunters: Tuesday, January 7th, 6:30-8:05 p.m.
A screening of the 2012 feature documentary film about exotic fruit cultivators and preservationists. Directed by Yung Chang and co-written by Chang and Mark Slutsky, and inspired by Adam Leith Gollner’s 2008 book of the same name. Family Literacy Day: Monday, January 27th, 7:00 -8:00 p.m. Celebrate Family Literacy Day with stories, games and much more. No registration required. Craft Connections: New Time! Mondays starting January 13th, 2:00 to 3:00 p.m. Need a break? Drop in and meet a group of crafty people who teach and learn from each other. Bring a project that you are working on or pick up a new craft in a friendly environment. Adult Chess Club (For ages 13 and up): Every Saturday starting January 4th, 1:00 to 2:30 p.m.
Gerrard Ashdale Writers Group: Alternate Saturdays: January 11th and 25th, 10:30 a.m. to Noon. Drop by and meet others at this community writers group. Bring a piece of writing to share, review and comment on others’ writing, and talk about process. Gerrard Ashdale Book Club: Thursday January 30th, 7:00 to 8:00 p.m. If you enjoy reading a range of literature and talking to others about books, this group is for you. Youth Advisory Group (YAG) (Ages 13 to 19): Every 4th Friday of each month, January 24th, 4:00 to 5:00 p.m.
Baby Time (For ages birth to 18 months): Wednesdays, January 15th, 22nd and 29th, 10:30 – 11:00 a.m.
Drop in, no registration required. Bouncing and tickling rhymes, songs and stories for babies with their parents and caregivers. Leading to Reading (Children in grades 1 – 6 as of Sept. 2013): Mondays, 5:00 – 6:00 p.m.
Children receive individualized help with reading and writing homework for one hour per week. This programme is currently full. Please call us to inquire about the wait list. Resume Critiquing: Thursdays starting January 9th, 2:00 – 3:00 p.m.
Free one on one resume critiquing and answers to your job search questions. Drop in or call to book your 30 minute appointment, 416-645-6000 x2316. English Conversation Circle: This programme is currently on hiatus and will resume on Tuesday, March 18th 2014. This entry was posted in Ashdale Village / Little India, Gerrard Street East on December 28, 2013 by The Ashbridge's neighbourhood. Firefighters battle blaze at house in city’s east end. Six people suffered minor smoke inhalation and one suffered minor burns to a hand after a fire broke out in a rowhouse in Toronto’s east end Friday morning, a fire official says. The three-alarm fire originated in a home on Laing Street, near Queen Street East and Greenwood Avenue, shortly before 7 a.m. and spread to at least one neighbouring house, the fire official told CP24. Firefighters removed two people from a neighbouring home, the official said. Dozens of firefighters were called to the scene and the blaze was brought under control at about 7:45 a.m. This entry was posted in Uncategorized on December 20, 2013 by The Ashbridge's neighbourhood. 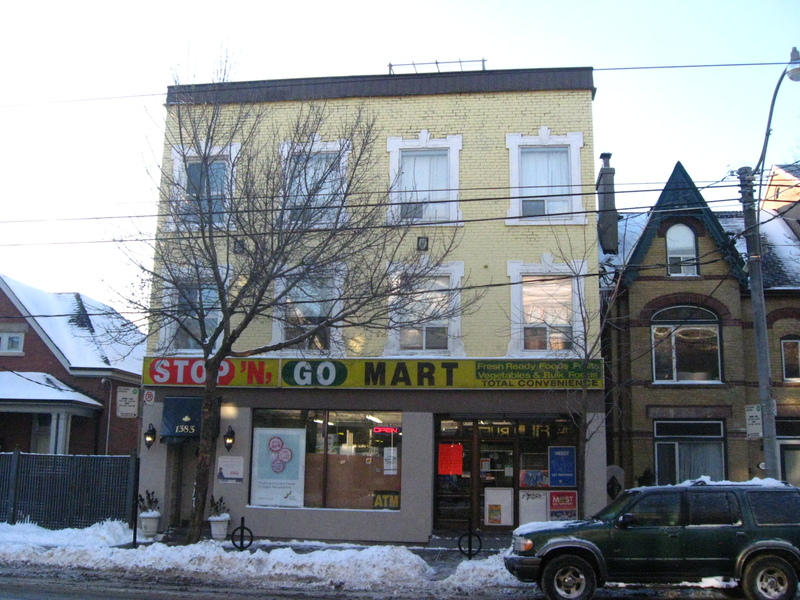 After more than 25 years at its current location at 1383 Queen East, Stop-N-Go is moving a couple of blocks west on Queen, to the former Sea Breeze Restaurant location. 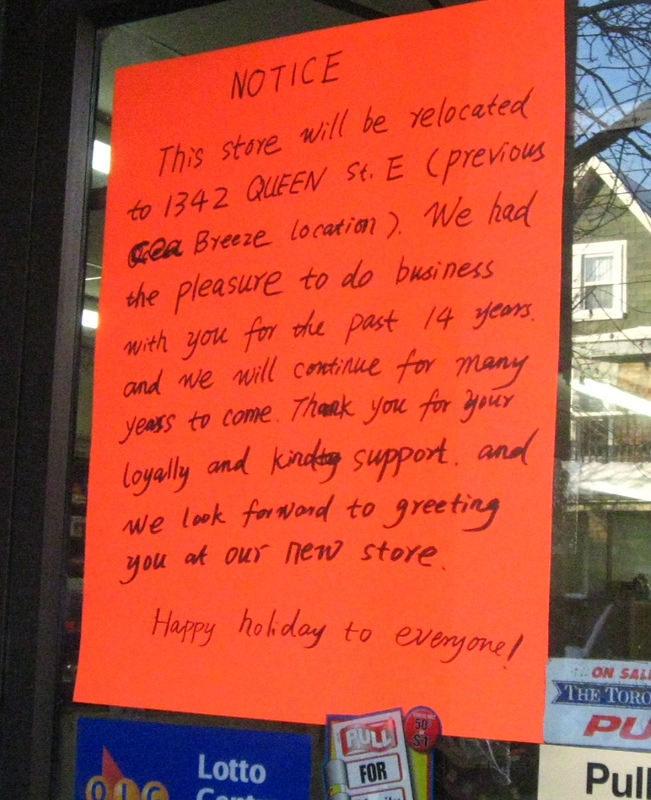 This entry was posted in Ashbridge's neighbourhood businesses, Queen Street, Uncategorized on December 16, 2013 by The Ashbridge's neighbourhood. 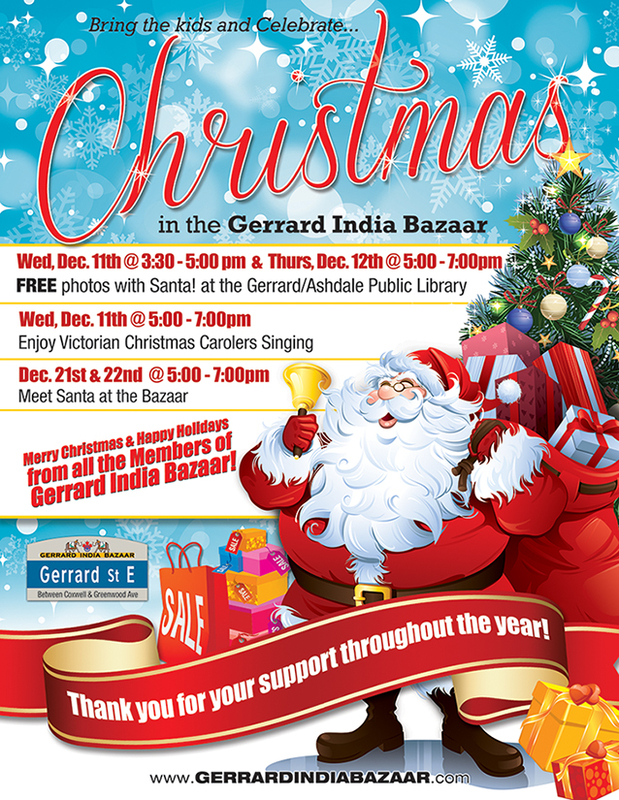 Celebrate Christmas in the Gerrard India Bazaar. Holiday Open House, Wednesday, Dec. 11th, 3:30 to 5:00 p.m.
Come and join in the festivities as Gerrard/Ashdale Library celebrates the holidays with stories, crafts and refreshments. Plus a visit from Santa! Free photo session included! Santa will return Thursday Dec. 12th, 5:00 – 7:00 p.m. for another photo session! Craft Connections, Wednesdays, Dec 11th & 18th, 2:00 to 3:00 p.m. Need a break? Drop in and meet a group of craft people who teach and learn from each other. Bring a project that you are working on or pick up a new craft in a friendly environment. Group projects for charities are possible and make others lives a little brighter. Adult Chess Club (For ages 13 and up), Saturday Dec. 14th, 1:00 to 2:30 p.m.
Gerrard Ashdale Writers Group, Saturday Dec. 14th, 10:30 a.m. to Noon. Drop by and meet others at this community writers group. Gerrard Ashdale Book Club, Thursday, Dec. 19th, 7:00 to 8:00 p.m. Youth Advisory Group (YAG), every 4th Friday of each month, Dec. 20th, 4:00 to 5:00 p.m. Registration required. Youth Volunteers needed. Make friends and earn volunteer hours while helping us to create a better library for youth in the community. Preschool Time (For ages 3 – 5), Fridays, Dec. 13th & 20th, 2 – 2:30 p.m. Stories, songs and rhymes for children with their parents or caregivers. * Those library locations that are scheduled to be open on December 24 and December 31, will be open from 9:00 a.m. to 1:00 p.m. This entry was posted in Ashdale Village / Little India, Gerrard Street East, Gerrard-Ashdale Library on December 10, 2013 by The Ashbridge's neighbourhood. 56 Woodfield Road, directly behind the Ashbridge Estate property. Winter 2014 registration starts on Saturday, December 7, 2013 for swimming, skating and March Break camps. You can register online now for other programs. S.H. Armstrong CRC opens for registration at 8:30 am on Saturday, December 7. For online registration (7am-12midnight): Go to toronto.ca/torontofun and follow the link to Search and Register. This entry was posted in Ashbridge Estate, S.H. Armstrong Community Recreation Centre on December 5, 2013 by The Ashbridge's neighbourhood.